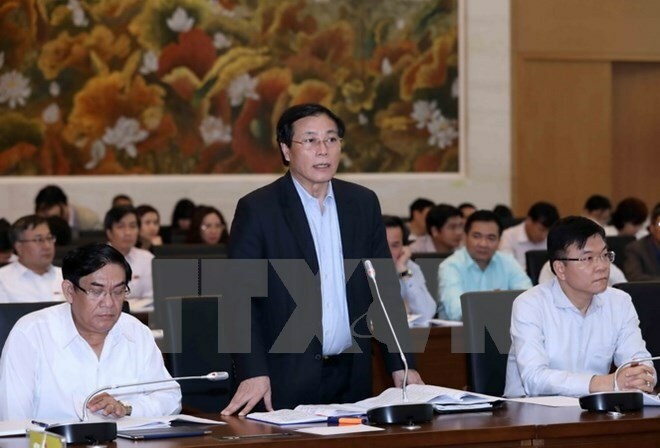 Hanoi (VNA) - Adjustments to the draft Law on Management and Use of Public Assets were high on the agenda at the National Assembly full-time deputies’ meeting in Hanoi on April 4. A majority of the deputies agreed on the scope of the adjustments. They reached a consensus on deciding the name of the laws, settling on the Law on Management and Use of Public Assets, as it is relevant to the current institution and legal system. However, about a dozen deputies were concerned with some regulations on the management of intangible public property, particularly those including natural minerals and resources, saying they were not sufficiently clear. They said unclear and unspecific laws could lead to loose management and result in vast losses for important public assets. Meanwhile, some others lawmakers commented that regulations on public asset management in the draft law did not accurately cover the concept of public assets. Specifically, they said, according to the draft law, public property is property owned by all people and managed by the State, which is regarded as the ownership representative and manager. Public assets can be tangible or intangible. They include those for State management and others services for the benefit of the State, such as services for national armed forces, public infrastructure, State financial funds, State foreign funds, lands and natural mineral resources. However, the deputies said the draft law mainly refers to the management of existing tangible assets and the management role was assigned to agencies and units which can also use the assets. Other types of assets which are suffering from losses are yet to be mentioned, said some of the deputies. For intangible assets like natural mineral resources, for example, the deputies proposed to specify the use and management roles of authorities at all levels. Many deputies demanded those authorities which, although not directly involved in the management or use of the assets, must also have responsibility for losses of the assets if they occurred. At the meeting, the full-time lawmakers also proposed more specific wording for the roles and duties of provincial departments in the management of public assets, including the management of natural resources and minerals in local areas. The draft Law on Management and Use of Public Assets aims to replace the 2008 Law on Management and Use of State Assets, which is currently in force. According to the Ministry of Finance, six years after the law’s implementation, the management and use of State properties has notched up some achievements. Properties in healthcare, education, culture and sport, and other sectors have dramatically increased to become an important financial resource for the country’s socio-economic development. But the law also exposed some shortcomings. The present law on State property management lacks a clear definition of the responsibilities and rights of managers and users, the separation of the responsibility and rights of those people, and the decentralisation of management.